HttpClient - Unable to write data to the transport connection: The socket has been shut down. I was given an application to debug lately and I encountered an error while sending a json. This request uses HttpClient, the content of the sending is 18Mb and contains 88 photos in base 64 in an HTML structure, in JSON. On the server, the php.ini is configured to accommodate requests of 100Mb max, so I do not think the error comes from the server. The application makes a post data and throws an exception to the middle of the mailing. I can not provide you with json, it is private but I can validate that besides its size it is valid. If you need information, for versions of packages for example, I am at your disposal. Which line throws this error? It seems you have used Sockets to upload your data, and it lost connection at some time. I'm having similar issues. My web view is closing and I have an httplistener trying to respond but the socket it closed. It crashes my app. Was there ever a solution? Seeing the same thing 22mar2019 with larger files (16mb in this case). Never happens with small (a few k) files. I not have found solution. I have limit photo number for the moment. Sadly that's not an option in my case. I have a single file of 16meg to transmit to a wifi-direct connected device. And get random socket disconnect errors with no determinable pattern. A couple times I've seen a deeply nested "null object reference" exception but didn't capture it or get drilled down to it before Visual Studio lost (timed out) connection to it. Making me wonder if some underlying framework mechanism is being disposed of prematurely. I had the idea to divide the files into blocks of 5mo and compile post sending to the webservice. I think this solution should work but I have not had time to look into it. We should try. I removed the Nuget reference for the NETStandard HttpListener and pulled in the actual project. Adding a catch to the try catch block here will catch the exception (System.IO.IOException: Unable to write data to the transport connection: The socket has been shut down). From there you can do what you wish but I ignore the exception as it is due to the user navigating away from the page before it has finished being served. I have made the Library author aware of the issue. I noticed that some web pages I was hosting have a large MP4 file and did not work on iOS. iOS was trying to stream the file. The client can try to stream a file by placing a Range key in the headers. See https://stackoverflow.com/questions/25898922/handle-range-requests-with-httplistener for how to handle Range requests. I do not know if this will solve your problem but I hope it helps! If I were going to a web service/server I controlled I'd do that. But since I'm going to a device with an embedded API I don't have that freedom. I've been able to trap the exception and catch from within the shared C# so I haven't had to change component packages. At this point I can handle the exception gracefully, display a popup that the transfer failed, delete the partial file on the receiving device, and re-try. I just hate having random behavior and the need for 0:n retries like that. I really appreciate you going the extra mile with that. But since I'm not in control of both sides I have to play by the limitations of the device and the manufacturer's API and the methods it exposes. So i can't do as the poster in that thread did: I can't abandon HTTP in favor of TCP. I have a method exposed by the API for uploading a file from the tablet to the device. It takes parameters for a couple things like directory and file name, and a byte that is the stream.content of the request. So when the component handling data transport is buggy - its not their problem. And to a great degree I can see their point. Using the device's embedded HTTP server and web interface I can upload the same file countless times, using Chrome or Firefox on the tablet. Presumably its the same calls on the device's backend. Which tells me its a problem in the Xamarin HTTPWebClient. If you think this is a problem with the Xamarin.Forms web client, you can always try to make them a report if none already exist. Keep me informed of the link to this one so that I can follow up, I'm interested. If I find the time, I will bring the items in my possession to the ticket. Well... we all know how that goes. I've lodged countless reproducible issues through Bugzilla and most get no attention, a couple closed with no reason, a couple closed with "that what we expect it to do regardless what the general coding community thinks"... and then 2 get some attention. I've seen no difference in how they are handled in the new GIT system. same people different technique for ignoring bug reports. And if I can't make a git repo that they can grab, run and reproduce the bug with everything short of a big flashing neon sign saying "See, here, this should be true not false" - then they close it for not being something they will research. One bug did I get great attention on, directly, through our MSDN support system which we pay dearly for. @JGoldberger was amazing and helpful and everything someone could ask for in support and help. But every other bug I've ever reported through normal channels just left me feeling disgusted about the entire backend department they have handling reports. They closed the bugzilla platform for some time. Today, they only go through GitHub for reports. I presume that if we are able to provide a fake file with the necessary unit tests it would be a plus. I should be able to look into it in 1 to 2 months minimum. Since the last updates they are more reactive for the consideration of the problems but one should not expect a resolution within 2 weeks of the report. I would just like to know if you have encountered the problem also on emulator or if it is only present on the physical peripherals? I have personally noticed the problem only on physical device. Yes. I know. I'm saying when it was the reporting system so many issues were never dealt with. Then when they "transferred" several open bugs that I was watching just never made it to the new GitHub mechantism. They just "slipped through the cracks". Seeing as there are issues without attention after 2 years - I've learned to not expect fast results. I know I said I had no issues when transferring though the device's Web interface... but there is an interesting development there. When you select a file you get the android popup "Select file the Android way or file way". It always succeeds "the android way" but fails randomly "the file way". Whatever those two are supposed to be. In researching that I think I'm getting close. It seems other apps are having issues with files as well, like when you try to attach a file to an email. It looks like after Android 6 getting file data needs to be done as content instead of as file. But I'm still researching but this information is looking promising. So after days of fighting this a casual conversation with a co-worker yielded an interesting response..
Huh? Naaaa... The guy is nuts. Right? Nope. Doing nothing more than taking the S off the endpoint path so it does HTTP instead of HTTPS (the device supports both)... 20 consecutive uploads of the 16mb file all successful. Same code that would randomly crash with no pattern... No changes other than going HTTP and its solid as a rock. PS: Yes, I was already handling all the credentials, ServicePointManager.ServerCertificateValidationCallback and so on. ANd it would work on occasion with HTTPS, if the moon was right and I sacrificed a chicken nugget after spinning in my chair counterclockwise. Point being - same code would work... then not.. then yes.. then no. Thank you for your inquiry. I'm trying to test this week. Glad you got it fixed! Thanks for posting the solution. 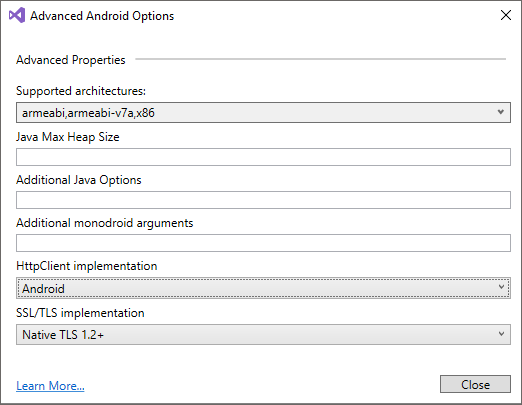 You can select the HttpClient implementation from Default, Managed, or Android. SSL and TLS implementation can also be set here.